This fun-filled evening will include a silent auction, cocktails, dinner, live auction and after party. Red carpet or character attire is suggested and optional. Cocktails start at 5 PM and dinner is at 7 PM. Reserve seating only at $60 per person. 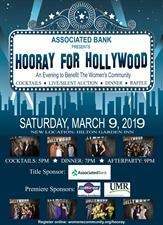 Associated Bank presents The Women's Community’s fundraiser: “Hooray for Hollywood!” on Saturday March 9 at the Hilton Garden Inn. Hooray for Hollywood is also brought to you by Premiere Sponsors: UMR & Miron Construction, AMAXIMMO, B.A. & Esther Greenheck Foundation, Cloverbelt Credit Union, Connexus Association, County Materials Corporation, Mid-State Truck Service, Inc., Nationwide, Ruder Ware, WoodTrust Bank, FOX WZAW & WSAW, Local iQ and 95-5 WIFC!